This tutorial is an easy way to learn how to use CTI Data Connector for Salesforce®. It is designed for all office workers who want to benefit from Computer Telephony integration. While completing these lessons, you will learn how to make an outgoing call, use the phone book or make the necessary configuration settings for your PBX system. Part I explains the basics for using CTI Data Connector for Salesforce® features, including how to make calls, receive calls or how to make personal configuration settings. Part II provides hands-on experience for using additional features like expert settings or database configuration. 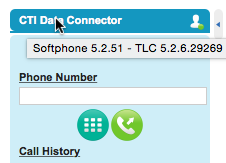 If you are unsure, which CTI Data Connector SoftPhone or CTI Data Connector - TAPI Link / CTI Data Connector - Skype for Business Link you have installed, just hover over the headline: CTI Data Connector in the CTI Data Connector SoftPhone. The version number is displayed. The CTI Data Connector SoftPhone application is updated regularly. We recommend checking for updates once per month. Information in this document is subject to change without notice. The software described in this document is furnished under a Master Subscription AgreementThe software may be used or copied only in accordance with the terms of those agreements. This documentation and the accompanying materials are for informational purpose only and property of Mirage Computer Systems GmbH. Information in this document is subject to change without notice. The names of companies, products, people, characters, and/or data mentioned herein are fictitious and are in no way intended to represent any real individual, company, product, or event, unless otherwise noted. No part of this publication may be reproduced, stored in a retrieval system, or transmitted in any form or any means electronic or mechanical, including photocopying and recording for any purpose other than the purchaser’s personal use without the written permission of Mirage Computer Systems GmbH.